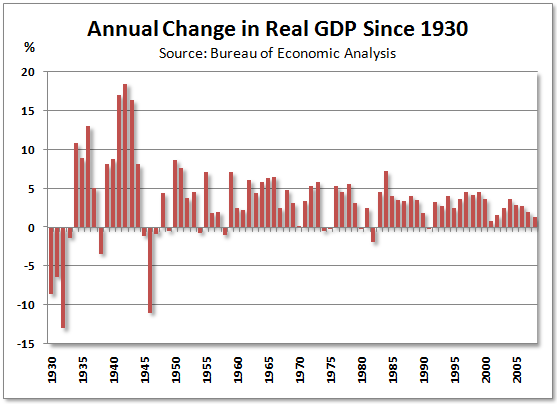 Curious to see what annual GDP growth since the Great Depression might look like, a chart was promptly whipped up. It's a bit surprising, particularly the World War II era. So much attention is paid to the annualized quarterly economic growth rates that you forget what things look like from year-to-year. The last recession in 2001 did not produce a contraction when measured over a calendar year, however, the three prior ones did in 1991, 1982, and 1980 with declines of 0.2 percent, 1.9 percent, and 0.2 percent, respectively. Unless a second half rebound materializes, that 1982 mark will be tested (if not shattered). The World War II period is pretty fascinating - who says war isn't good for the economy?